Although I had the intention to make my last apartment feel like home, it didn’t go nearly as planned. I failed to add decor in my budget and VASTLY underestimated what it costs to decorate. I had a budget that furnished my apartment, as I had a bed, a couch etc. But things that served no purpose — abstract centerpieces and that cute tiny mirror that you can’t actually use — I couldn’t afford. So like anyone who spends time on the internet, I thought, Whatever I’ll just DIY the heck out of this. And girl, was I misguided. Not only did it cost me a lot of money to find all the pieces of these magical projects, but I also can’t believe the time it took, my friend. The time! The trial and error wasted more time and money than I had bargained for, and when I finally had a completed project, it never felt like it was worth it. All the effort outweighed the benefit because, no. It was not cute in a rustic way. So here I am, new apartment, new me right? Wrong! Same me. Just improved. Better decisions made. I did a couple of DIY budget-savvy things in this apartment, but I learned from my mistakes and I am here to share some tips with you. 1. Find space and inspiration first. Your space right now is probably not empty. Look around and find the gaps that you want to fill or the areas you want to change, and be specific about what you can envision there. If you aren’t a theme type of person, that’s okay! Many decor styles can be blended — it’s all about what YOU want. The worst thing to do is buy a bunch of wasteful crap you have no space for or it doesn’t fit your vibe. Pinterest, Instagram, Magazines, YouTube, etc. have tons and tons of inspiration to find your vibe. Pair ideas you find with the pieces you already have. Hear me out. There are some good pieces at the thrift store that you don’t have to play up (or sand down) to make look good if you know what you’re looking for. If you aren’t near a thrift store, turn to garage sales or friends and family who are spring cleaning — but be intentional. If you need a basket to hold all your fruit on the counter, be on the hunt for that alone. If you need an extra chair in the living room because you often have friends over, search for only that. It’s easy to fall into the trap of buying trinkets and things that look cute but serve no purpose. Sometimes one man’s trash is just trash. Keep an eye out for things that are actually functional instead. When I go thrifting, I often find pieces that I hang on a wall or cute bowls and jars I can use as plant holders. 3. Find use in the unconventional. You don’t need hairpin legs, an old barn door, and crazy glue for it to qualify as a DIY project. In my living room, I created a super quick gallery wall with just some tiny command strips, and it turned out great! I have framed covers of classic books by amazing black women authors, old jazz vinyls, and a textured old blanket with a print that takes feels nostalgic, in a frame that looks wonderful. These make me feel like I am not sacrificing my identity to stick to a budget. Also, I found each of these things whilst decluttering. Additionally, I have an abundance of books I refuse to get rid of, and I use those and a plank of wood as side tables to my couch. In my kitchen, I hung a basket I took from a friend on the wall, and I use it as a shelf for my onions. I have (too many) wine bottles around the house with flowers, and even some old Halloween beakers in my bathroom with a baby’s breath plant that looks exactly like the cute ones in West Elm and Ikea. Sometimes, it just takes a little imagination. 4. You can still have a decorated space that is minimal. If a minimal look is your style, I am sure your pockets are already happy. I find solace in some places in my apartment that are minimal, like my bathroom and my workspace. I like my bathroom to feel like a spa, and take plenty of baths in this era of “self-care is a bath bomb away.” It’s helpful to take a load off when my bathroom is simple. Same goes for my workspace; I have a small recycled jar to hold my pens, and all the essentials. Near my workspace is a framed (TFD!) quote for inspiration, and that is about it. 5. You’ve heard it before folks, but plants. Plants are amazing decor pieces, and yes, sometimes they are hard to keep alive. But there are plenty of low maintenance plants out there. (Read a great guide to them here!) I am not a fan of fake plants, but if that’s your vibe, go for it! Plants can be an inexpensive way to add life to your space and come in a billion different shapes and sizes. I find the most expensive part of buying a plant is actually the pot, and for this, you can use about anything. If your plant requires a drainage hole and you are using something that doesn’t have one, you can even create a drainage layer with pebbles or activated charcoal. As I look over and see this beautiful cover from this recent issue of The New Yorker, I can already see a couple revamps to prints in my own apartment. 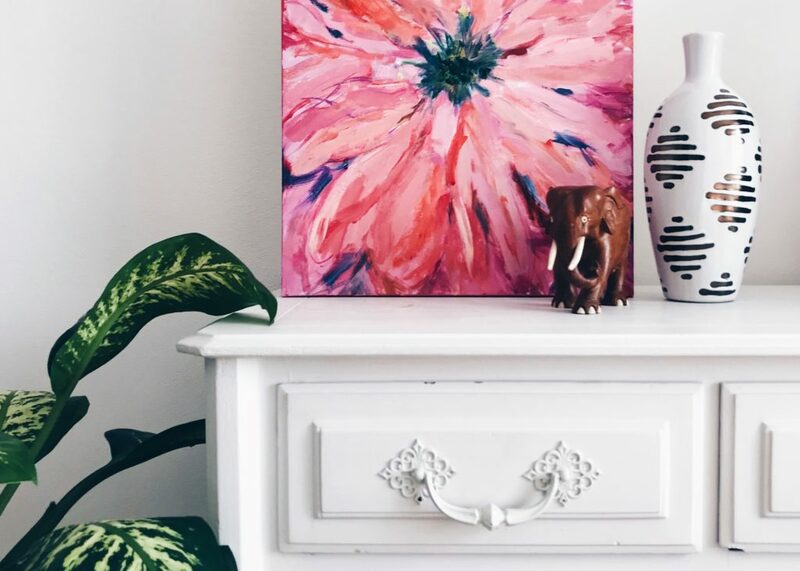 Budget DIY projects and loving your space don’t have to come with weighty price tags and a ton of skill. I invite you to imagine up a welcoming space for yourself that doesn’t make you (or your wallet) cringe at that thought of creating it. Julie Browny is a writer and LGBT+ & black rights activist from the Bronx, New York – residing in Norfolk, Virginia. She currently works at a criminal justice nonprofit dedicated to ending over-policing and redefining safety. She also sits on the advisory board of a private education consulting organization that aims to find unrevealed ways racism, privilege and power impact school’s equitable practices. Julie is navigating being a young black queer femme in the workplace whilst building her own financial portfolio, curating spaces she loves and empowering others to do the same.